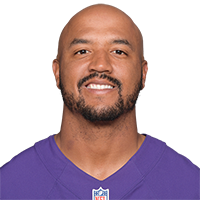 Floyd caught 10 of 24 targets for 100 yards and a touchdown in 13 games with Washington in 2018. Floyd had one catch (three targets) for a seven-yard touchdown in Saturday's 25-16 loss to Tennessee. Analysis: Floyd was able to catch his first touchdown pass of the season after moving up to third on the depth chart with Maurice Harris (concussion) ruled out. While the score was nice, the overall lack of involvement severely limits Floyd's fantasy appeal. 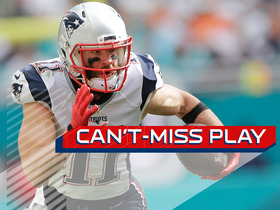 (He hasn't caught more than two passes in a game all season.) The veteran shouldn't draw much fantasy interest even if Harris can't play against the Eagles in Week 17. Floyd caught two of three targets for 16 yards in Sunday's 16-13 win over Jacksonville. Analysis: Floyd has made a decent case to usurp an ice-cold Maurice Harris for the No. 3 wideout role, and yet the two players still seem to be sharing snaps. 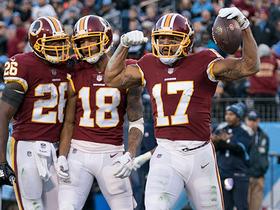 Regardless, there isn't much production to be had in the Washington offense, particularly with a tough road matchup against the Titans on tap in Week 16. 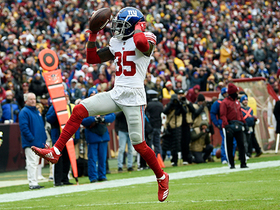 Floyd was held without a catch on two targets in Sunday's 40-16 loss to the Giants. Analysis: Floyd played 31 of 62 snaps (50 percent) on offense, finishing fourth among Washington wide receivers. He could get a few more chances if Josh Doctson (concussion) misses time, but a Week 15 contest at Jacksonville doesn't provide much cause for optimism, nor does the Redskins' quarterback situation with Josh Johnson expected to start. Floyd played 33 of 75 snaps (44 percent) on offense in Sunday's 23-21 loss to Houston, catching one pass for 18 yards on three targets. Analysis: Floyd essentially split the No. 3 receiver job with Maurice Harris (41 snaps), while Josh Doctson (64) and slot man Trey Quinn (53) were regular parts of the offense. There wasn't much upside in the passing game with Alex Smith (leg) under center, but that doesn't mean Colt McCoy will provide an upgrade. Floyd may fall out of the offense altogether if/when Jamison Crowder (ankle) finally gets healthy. Floyd played 31 of 58 snaps (53 percent) on offense in Sunday's 16-3 win over Tampa Bay, catching two of three targets for 15 yards. Analysis: Floyd has taken over as the No. 3 wide receiver in an injury-depleted offense, at least until Jamison Crowder (ankle) is able to return. With Crowder looking shaky for Week 11 against Houston, we could see Floyd get another extended look against a tough Texans defense. Floyd will start at outside receiver for Paul Richardson (shoulder/knee) against the Cowboys on Sunday, Adam Schefter of ESPN reports. Analysis: The Redskins are without Richardson, slot receiver Jamison Crowder (ankle) and receiving back Chris Thompson (ribs/knee), relying instead on fill-in options Floyd and Maurice Harris to pick up the slack. Jordan Reed is the best bet to see the highest target count, but with few established options otherwise, Floyd's first catch as a Redskin -- and first since Week 16 of last season with the Vikings -- could be imminent. Floyd is active for Monday's contest in New Orleans, John Keim of ESPN.com reports. Analysis: In his second chance to do so with the Redskins, Floyd is poised to earn snaps, and while Paul Richardson is blocking his path to reps as a Z receiver, Floyd may get in on the act at X receiver in the absence of Josh Doctson (heel). No matter, Floyd will have to contend with Maurice Harris for reps at that spot, capping his potential due to a lack of guaranteed work. Floyd (coach's decision) is listed as inactive Sunday versus the Packers. Analysis: Floyd was one of two wide receivers signed to bolster the position in Washington this week, but he's the only one to survive until game day after Breshad Perriman was waived Saturday. With little time to learn the playbook or fit in many drills, it's no surprise Floyd is on the Redskins' inactive list Week 3. In the long run, it'll be interesting to see if he can jump Brian Quick or Maurice Harris, both of whom have experience with coach Jay Gruden's game plans. The Redskins signed Floyd to a contract Monday, Ian Rapoport of NFL Network reports. Analysis: After posting 209 catches for 3,293 yards and 19 touchdowns while missing just one game the first four years of his career, Floyd has fallen off the NFL map the past two campaigns, with a 47-566-5 line in 26 games during that span. The Redskins provide a spot for Floyd to make an impact, but he'll have to battle his way up the depth chart to do so. Floyd has been released by the Saints, Nick Underhill of The New Orleans Advocate reports. Analysis: Floyd signed with New Orleans during the first week of training camp, hoping to make a push for one of the final roster spots. Now three years removed from his last productive season, the 2012 first-round pick may be running out of chances in the NFL. The Saints signed Floyd on Tuesday, Nick Underhill of The Baton Rouge Advocate reports. Analysis: The receiving corps is currently sans Brandon Coleman (undisclosed, PUP list) and Travin Dural (arm) for an undetermined amount of time. Floyd thus arrives in New Orleans to act as a camp body with the potential to get into the good graces of coach Sean Payton and quarterback Drew Brees. Michael Thomas, Ted Ginn, Cameron Meredith and rookie Tre'Quan Smith all own guaranteed roles in the offense, but Floyd could eke his way into that group with a productive preseason. Floyd recently worked out for the Ravens, Field Yates of ESPN reports. The Vikings aren't considering re-signing Floyd, Chris Tomasson of the St. Paul Pioneer Press reports. Analysis: A St. Paul native and 2012 first-round pick, Floyd failed to revive his career last season with his hometown team, catching 10 of 17 targets for 78 yards in 11 games. He'd probably need a top-three receiver job to be worth keeping on the roster for another year, given that he's a total non-contributor on special teams. The 28-year-old shouldn't have too much trouble finding an organization willing to let him compete for a roster spot, though he'd have an easier time if he played special teams. Floyd recorded 10 receptions for 78 yards through 11 games in 2017. Floyd failed to catch his lone target in Sunday's blowout victory over the Bengals. Analysis: Floyd played 14 of 67 offensive snaps and was the recipient of one of Teddy Bridgewater's two pass attempts. Floyd was out-snapped by Laquon Treadwell 24-14, and Stefon Diggs and Adam Thielen remain the only viable fantasy options among Vikings' wide receivers for most formats. Floyd had one reception for three yards on two targets in Sunday's loss at Carolina. Analysis: Floyd played just five snaps on offense as he's fallen to fifth on the wide receiver depth chart. No wideout after Stefon Diggs and Adam Thielen is getting enough playing time for viable fantasy value in most formats. Floyd had two receptions for 20 yards on three targets in Sunday's 14-9 win at Atlanta. Analysis: Floyd played just six snaps on offense but had two receptions for the second time in three games. No receiver after Stefon Diggs and Adam Thielen is getting enough playing time for viable fantasy value in most formats. Floyd had two receptions for 16 yards on two targets in Sunday's 24-7 win over the Rams. Analysis: Floyd played 16 snaps on offense after playing just eight combined the previous two games. It was good to see him get off the bench, but there's little sign he'll have more than a token role in the offense as he's buried on the depth chart. Floyd was not targeted in the passing game and played just two snaps on offense in Sunday's win at Washington. Analysis: There was talk in the preseason that Floyd may win the third receiver role or be a major factor in the offense, but that's all but faded away as he's been stuck on the bench. He has just three receptions on four targets in four games since returning from his suspension. 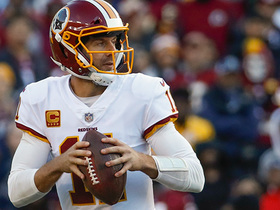 Washington Redskins quarterback Alex Smith connects with wide receiver Michael Floyd for a 20-yard gain. 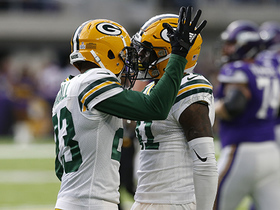 Green Bay Packers cornerback Damarious Randall intercepts a pass thrown by Case Keenum. 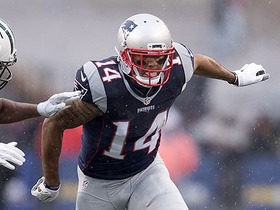 New England Patriots wide receiver Michael Floyd makes huge block to help wide receiver Julian Edelman to a 77-yard touchdown on a quick pass from quarterback Tom Brady. 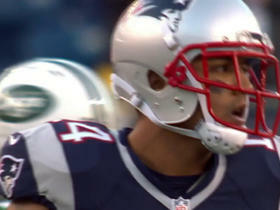 New England Patriots wide receiver Michael Floyd scores his first touchdown as a Patriot on a catch and run. 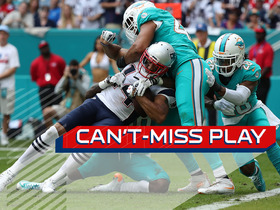 NFL Network's James Palmer joins "Up To The Minute" and discusses Patriots wide receiver Michael Floyd. 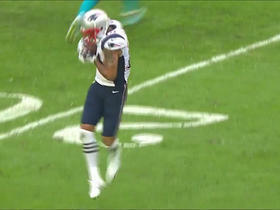 New England Patriots QB Jimmy Garoppolo finds wide receiver Michael Floyd for a 6-yard gain.